Although mitochondrial oxidative phosphorylation (OxPhos) dysfunction is believed to be responsible for beta cell dysfunction in insulin resistance and mitochondrial diabetes, the mechanisms underlying progressive beta cell failure caused by defective mitochondrial OxPhos are largely unknown. We examined the in vivo phenotypes of beta cell dysfunction in beta cell-specific Crif1 (also known as Gadd45gip1)-deficient mice. CR6-interacting factor-1 (CRIF1) is a mitochondrial protein essential for the synthesis and formation of the OxPhos complex in the inner mitochondrial membrane. Crif1 beta−/− mice exhibited impaired glucose tolerance with defective insulin secretion as early as 4 weeks of age without defects in islet structure. At 11 weeks of age, Crif1 beta−/− mice displayed characteristic ultrastructural mitochondrial abnormalities as well as severe glucose intolerance. Furthermore, islet area and insulin content was decreased by approximately 50% compared with wild-type mice. Treatment with the glucoregulatory drug exenatide, a glucagon-like peptide-1 (GLP-1) agonist, was not sufficient to preserve beta cell function in Crif1 beta−/− mice. Our results indicate that mitochondrial OxPhos dysfunction triggers progressive beta cell failure that is not halted by treatment with a GLP-1 agonist. The Crif1 beta−/− mouse is a useful model for the study of beta cell failure caused by mitochondrial OxPhos dysfunction. The online version of this article (doi: 10.1007/s00125-015-3506-y) contains peer-reviewed but unedited supplementary material, which is available to authorised users. Whole body glucose homeostasis depends on the dynamic functional capacity of beta cells in pancreatic islets . Beta cell dysfunction, as defined by a decrease in individual beta cell function or whole beta cell mass, is a hallmark of diabetes [2, 3, 4]. However, the causes of beta cell dysfunction during the progression of insulin resistance and diabetes remain to be elucidated . Dysfunction of cellular organelles, such as the endoplasmic reticulum and mitochondria, has long been studied as the underlying defect in beta cell dysfunction in diabetes [6, 7]. The mitochondria are implicated in several aspects of beta cell function and dysfunction in diabetes [8, 9]. Beta cell mitochondria not only generate metabolic signals for insulin exocytosis in response to glucose oxidation [10, 11] but also participate in the processes of apoptosis, necrosis and autophagy [12, 13]. In the context of mitochondrial dysfunction, these cellular processes are thought to be responsible for beta cell loss in the progression of diabetes . To elucidate the roles of mitochondrial oxidative phosphorylation (OxPhos) dysfunction in the pathogenesis of diabetes, animal models harbouring mitochondrial OxPhos alterations in beta cells have been developed. Loss of mitochondrial transcription factor A (TFAM), an obligatory mitochondrial DNA (mtDNA) transcription factor in beta cells, results in spontaneous hyperglycaemia associated with reduced insulin secretion and beta cell loss . Loss of the mitochondrial translation factor transcription factor B1 mitochondrial (TFB1M) specifically from beta cells leads to beta cell dysfunction and loss of beta cell mass . Taken together, these findings support the hypothesis that impaired OxPhos function contributes to the pathogenesis of diabetes. To analyse the role of mitochondrial OxPhos dysfunction in beta cells, we generated a mouse model of OxPhos dysfunction by specifically deleting the nuclear Crif1 (also known as Gadd45gip1) gene in pancreatic beta cells. CR6-interacting-factor 1 (CRIF1) is a mitochondrial protein that specifically interacts with the protein components of the large subunit of the mitochondrial ribosome and plays an essential role in the synthesis of mtDNA-encoded OxPhos polypeptides and subsequent insertion of OxPhos subunits into the inner mitochondrial membrane . Therefore, its disruption results in marked failure of mitochondrial respiration caused by the loss of OxPhos complex formation in the mitochondrial inner membrane [18, 19]. Importantly, our animal model of CRIF1-deficiency in pancreatic beta cells exhibited accelerated and progressive beta cell failure phenotypes that will be useful for the study of beta cell failure associated with mitochondrial OxPhos dysfunction. All animal experiments were reviewed and approved by the Committee on the Ethics of Animal Experiments of Chungnam National University Graduate School of Medicine and were performed according to the institutional guidelines for care and use of laboratory animals. Ins2-Cre transgenic mice (C57BL/6-Tg[Ins2-cre]25Mgn/J) were purchased from Jackson Laboratory (Bar Harbor, ME, USA). Floxed Crif1 (Crif1 flox/flox) mice were generated as described previously . Crif1 flox/flox mice were mated with Ins2-Cre transgenic mice to produce beta cell-specific Crif1-knockout (Crif1 beta−/−) mice. (see Electronic Supplementary Materials [ESM] Methods for further details). Exenatide (Byetta, Eli Lilly, Indianapolis, IN, USA) was administered to Crif1 beta−/− mice (10 nmol/kg) by daily subcutaneous injection for 4 weeks starting at 4 weeks of age. Mouse embryonic fibroblasts (MEFs) and MIN6 cells were maintained in DMEM containing 25 mmol/l glucose, 15% (wt/vol.) FBS, 1% (wt/vol.) penicillin, and a streptomycin cocktail (Roche Diagnostics, Mannheim, Germany). Pancreatic tissues were sectioned using an EM UC6 ultramicrotome (LEICA) and stained with 4% (wt/vol.) uranyl acetate and citrate. Sections were observed using a Tecnai G2 Spirit Twin transmission electron microscope (FEI Company, OR, USA) and a JEM ARM 1300S high-voltage electron microscope (JEOL, Tokyo, Japan; see ESM Methods for further details). Approximately 100–150 isolated islets were cultured overnight , washed once with PBS, and lysed directly in SDS sample buffer supplemented with a protease inhibitor cocktail (Roche Diagnostics). Western blot analysis was performed according to standard methods with the indicated antibodies (see ESM Methods for further details). The oxygen consumption rate (OCR) in isolated islets was measured using a Seahorse XF-24 Analyzer (Seahorse Bioscience, North Billerica, MA, USA) . (See ESM Methods for further details). Islets were isolated from 4-week-old and 11-week-old mice fed a normal chow diet as described previously . Insulin concentrations were measured using an insulin ELISA kit (Alpco Diagnostics, Windham, NH, USA; see ESM Methods for further details). For the glucose tolerance test (GTT), mice were fasted overnight (16 h) and glucose (2 g/kg) was administered by i.p. injection or gavage feeding. Blood glucose levels were measured with a glucometer (Accu-CHEK Active, Roche Diagnostics). For the ITT, mice were fasted for 6 h prior to receiving an i.p. injection of 0.75 U/kg insulin (Humalog, Eli Lilly, Indianapolis, IN, USA) and blood glucose levels were measured. Plasma insulin levels were measured using a mouse insulin ELISA kit (Alpco Diagnostics). The pancreas was excised, weighed, incubated in 10% (wt/vol.) neutral buffered formalin (NBF; Histoperfect fixation, BBC Biochemical, WA, USA) for 4 h, and embedded in paraffin. Sections (4 μm thick) were cut at 60 μm intervals, processed by haematoxylin and eosin staining, and observed by light microscopy (Olympus). The surface area of islets was analysed using Image Inside software  (see ESM Methods for further details). The proliferation rate was based on the percentage of cells positive for both Ki67 and insulin. A minimum of 4,000 insulin-positive cells were counted per pancreatic section. Statistical analyses were completed using SPSS version 21 (IBM, Chicago, IL, USA). We used the unpaired, two-tailed Student’s t test for two group comparisons. For three group comparisons, we used one-way ANOVA followed by the Tukey honest significant difference (HSD) test for multiple comparisons. A level of p < 0.05 was considered to be statistically significant. All data were expressed as means ± SEM. CRIF1 is a mitochondrial protein associated with the large subunit of the mitochondrial ribosome and plays an essential role in the synthesis of mtDNA-encoded OxPhos polypeptides (ESM Fig. 1a,b) . Mitochondria isolated from homozygous Crif1-deficient MEFs (-/Δ) showed a markedly reduced level of nascent translation products (ESM Fig. 1c). In immunofluorescence analysis, CRIF1 colocalised with voltage-dependent anion-selective channel protein 1 (VDAC1) in MIN6 cells (Fig. 1a), indicating that it is present in the mitochondria of beta cells. Thus, we induced beta cell-specific Crif1 knockout using a Cre-loxP system (ESM Fig. 2a) to investigate the in vivo effect of mitochondrial OxPhos dysfunction [24, 25]. Crif1-floxed mice (Crif1 f/f) were crossed with Ins2-Cre mice to obtain Crif1 beta−/− (Crif1 flox/flox;Ins2-Cre +/ − ) mice (ESM Fig. 2b; see ESM Methods for genomic DNA PCR analysis). Lack of CRIF1 protein expression in the pancreatic islets of Crif1 beta−/− mice confirmed efficient Cre-mediated deletion of Crif1 gene from beta cells (Fig. 1b). Transmission electron microscopy (TEM) demonstrated that mitochondria of Crif1-deficient MEF and Crif1 beta−/− beta cells exhibited structural abnormalities characterised by marked intra-cristal swelling and reduced electron density in the mitochondrial matrix (Fig. 1c, ESM Fig. 3). An increased number of mitochondria and higher expression of VDAC1 indicated that mitochondrial biogenesis was upregulated in Crif1 beta−/− beta cells. The concomitant quantitative increase in heat shock protein 60 (HSP-60), which acts as a marker of mitochondrial stress, suggested increased mitochondrial biogenesis in Crif1 beta−/− beta cells caused by an adaptive response to mitochondrial dysfunction due to Crif1 loss (Fig. 1d, e). Food intake and body weight did not significantly differ between wild-type (WT; Crif1 +/+ ;Ins2-Cre +/ − ), Crif1 beta+/− (Crif1 flox/+;Ins2-Cre +/ − ) and Crif1 beta−/− mice (Fig. 2a–c). To determine the effect of mitochondrial dysfunction caused by beta cell-specific Crif1 knockout, Crif1 beta−/− mice were subjected to i.p. glucose tolerance tests GTT (IPGTT) at 4 and 11 weeks of age. Crif1 beta−/− mice developed glucose intolerance at 4 weeks of age (Fig. 2d), which was characterised by a decrease in insulin secretion in response to glucose stimulation during IPGTT (Fig. 2e). At 11 weeks of age, glucose level at the same time point was higher than that of 4-week-old mice (Fig. 2f), although the deficiency in insulin secretion during IPGTT was similar to that of 4-week-old mice (Fig. 2g). Despite severe glucose intolerance, the insulin sensitivity of Crif1 beta−/− mice remained normal at 11 weeks of age (Fig. 2h). Thus, Crif1 beta−/− mice developed diabetes with insufficient insulin secretion in response to glucose, suggesting an essential role for Crif1 in beta cell function. To delineate the relationship between abnormal mitochondrial function and defective insulin secretion in Crif1 beta−/− mice, we measured the OCR in purified islets (Fig. 3a). Basal OCR was similar in WT and Crif1 beta−/− islets. However Crif1 beta−/− islets showed different OCRs after 20 mmol/l glucose stimulation. Glucose stimulation increased OCR by 2.1-fold in WT islets, while Crif1 beta−/− islets showed only a 1.3-fold increase. In Crif1 beta−/− islets, the response to 5 μmol/l oligomycin (an ATP synthase inhibitor) was normal, but the response to carbonyl cyanide m-chlorophenyl hydrazone (CCCP; a mitochondrial respiration uncoupler) was delayed, and the maximum capacity was decreased (a 2.4-fold increase in WT mice vs a 1.8-fold in Crif1 beta−/− mice; ESM Fig. 4). The decreased OCR in Crif1 beta−/− islets following glucose stimulation suggested that impaired OxPhos function in beta cells could lead to inappropriate insulin secretion in response to glucose because normal mitochondrial OxPhos function is required for glucose-stimulated insulin secretion. To determine the effect of Crif1 knockout on insulin secretion per se, we calculated fractionated insulin secretion from each islet and confirmed that insulin secretion from Crif1 beta−/− islets upon either glucose or KCl stimulation was reduced in both 4-week-old and 11-week-old mice (Fig. 3b, c). Since KCl can directly stimulate insulin secretion without increasing ATP production in mitochondria, these data suggest that beta cells of Crif1 beta−/− mice have more profound defects than simple mitochondrial OxPhos dysfunction. The worsening of glucose tolerance in Crif1 beta−/− mice with age and loss of KCl-dependent insulin secretion in Crif1 beta−/− islets suggested that mitochondrial dysfunction in beta cells could progressively deteriorate the functional integrity of the beta cells. Thus, we examined the pancreatic islets of Crif1 beta−/− mice in an age-specific manner. Immunofluorescence staining for insulin and glucagon revealed no difference in immunoreactivity among the different groups: WT, Crif1 beta+/− and Crif1 beta−/− mice at 4 weeks of age (Fig. 4a). However, Crif1 beta−/− mice showed extensive loss of insulin-positive beta cells at 11 weeks of age (Fig. 4a). 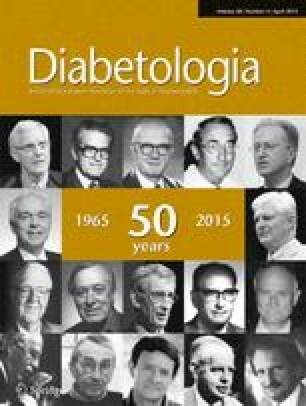 Pancreatic insulin content was reduced in Crif1 beta−/− mice by 20% at 4 weeks of age and by 68% at 11 weeks of age (Fig. 4b, c). Islet area was comparable among all groups at 4 weeks of age but decreased by 45% in Crif1 beta−/− mice compared with WT and Crif1 beta+/− mice (12.7 × 105 μm2 vs 21.9 × 105 μm2 vs 20.9 × 105 μm2, respectively) at 11 weeks of age (Fig. 4d, e). These findings indicate that Crif1 beta−/− mice exhibit loss of beta cell mass. To determine the underlying mechanism responsible for the progressive loss of beta cell mass, we measured beta cell proliferation using immunofluorescent staining for Ki67, a marker of cell proliferation (Fig. 5a). The proportions of Ki67-positive cells decreased significantly in Crif1 beta−/− mice at both 4 weeks and 11 weeks of age (Fig. 5b, c). To examine the level of beta cell loss in Crif1 beta−/− mice, we first measured the level of apoptosis in the islets and found no significant differences in TUNEL staining (data not shown) or immunostaining for cleaved caspase 9 (ESM Fig. 5a,b). Interestingly, in TEM images of Crif1 beta−/− beta cells, we observed the characteristic features of autophagosomes, which were surrounded by double membranes and contained small mitochondria, suggesting the occurrence of mitophagy (Fig. 5d) . In association with these findings, the endoplasmic reticulum was distended around the swollen mitochondria (ESM Fig. 5c) . Western blot analysis showed increased microtubule-associated protein light chain 3 (LC3)-II immunoreactivity (Fig. 5e), and immunohistochemical staining for LC3B revealed the strong induction of LC3B expression in the pancreatic islets of Crif1 beta−/− mice (Fig. 5f). Immunofluorescent staining for LC3 revealed an increase in LC3-puncta in the beta cells of 11-week-old Crif1 beta−/− mice (ESM Fig. 6). These results indicate that autophagy is associated with the features of islets in Crif1 beta−/− mice, which agrees with previous studies showing reduced beta cell mass without evidence of increased apoptosis in patients with mitochondrial diabetes [28, 29]. The glucagon-like peptide-1 (GLP-1) agonist, exenatide, is known to improve insulin secretion [30, 31], stimulate pancreatic beta cell proliferation [32, 33] and prevent beta cell death [34, 35]. To determine whether exenatide might have a protective effect on the progressive deterioration of beta cell function in Crif1 beta−/− mice, we treated WT and Crif1 beta−/− mice with daily s.c. injections of exenatide (10 nmol/kg) or saline for 4 weeks, beginning at 4 weeks of age, when the beta cell mass is comparable between the two groups. In WT mice with normal beta cell morphology, exenatide treatment increased beta cell proliferation and mass (Fig. 6a, b and ESM Fig. 7). However, exenatide did not increase beta cell proliferation or mass in Crif1 beta−/− mice and no beneficial effect on islet morphology was observed (Fig. 6a, b and ESM Fig. 7). In addition, neither glucose tolerance nor insulin secretion was improved in Crif1 beta−/− mice treated with exenatide (Fig. 6c, d). These data suggest that GLP-1 agonists or dipeptidyl peptidase 4 (DPP-4) inhibitors might not have protective effects in patients presenting with deteriorated mitochondrial dysfunction. CRIF1 is a mitochondrial protein that associates with the large mitoribosomal subunits located close to the polypeptide exit tunnel and facilitates the co-translational insertion of mtDNA-encoded nascent OxPhos polypeptides into the inner membrane . Therefore, homozygotic and heterozygotic loss of Crif1 in specific organs results in markedly or marginally reduced OxPhos capacities, respectively [18, 36]. For example, homozygotic and heterozygotic Crif1-deficiency in adipose tissue produces widely variable disease phenotypes in vivo . These results demonstrate that genetic ablation of Crif1 in a tissue-specific fashion is a useful model for the study of tissue responses to variable degrees of reduced OxPhos capacity. An interesting finding of the present study was that diabetic phenotypes in Crif1 beta−/− mice developed as early as 4 weeks of age and persisted until 11 weeks of age. The beta cell mass was not different from that in WT mice, but islets isolated from 4-week-old Crif1 beta−/− mice showed reduced glucose-stimulated insulin secretion. Therefore, the main cause of glucose intolerance in 4-week-old Crif1 beta−/− mice can be attributed to secretory defects in insulin secretion in response to glucose. The decreased insulin content in 4-week-old Crif1 beta−/− mice, without a decrease in beta cell mass, may be owing to decreased synthesis or defective maturation or processing of pre-proinsulin in the presence of mitochondrial dysfunction. Heterozygous superoxide dismutase 2 (SOD2) deficiency in mice resulted in impaired glucose-stimulated insulin secretion, suggesting that oxidative stress might be linked with diminished insulin secretion . Based on higher expression of 8-oxo-2′-deoxyguanosine (8-OHDG) in the pancreatic islets of Crif1 beta−/− mice (data not shown), increased oxidative stress might contribute to the decrease of beta cell secretory capacity. Taken together, the early phase of CRIF1 loss in pancreatic beta cells resulted in defects in metabolic coupling sufficient to develop into systemic glucose intolerance. It is clear that the pancreatic islets in Crif1 beta−/− mice were significantly reduced in terms of beta cell mass. These changes reflect progressive cellular dysfunction caused by Crif1 loss in beta cells. Previous reports suggest that the rapid progressive loss of beta cells may be caused by accelerated cell death via apoptosis and necrosis [38, 39]. However, our failure to detect apoptosis markers in the islets of Crif1 beta−/− mice may indicate that active apoptosis is not the principal cause of beta cell failure. Increased mitophagy is prevalent in cells with dysfunctional mitochondria [40, 41]. Consistent with this finding, TEM revealed that beta cells in the islets of Crif1 beta−/− mice contained an increased number of autophagosomes. However, our experimental findings did not determine the role of increased beta cell autophagy, which may have contributed to beta cell loss in CRIF1-deficiency. Previous reports indicate that beta cell proliferation can compensate for the loss of beta cell mass or function to maintain normal glucose tolerance [42, 43]; however, homozygotic Crif1-deficient mice did not exhibit this proliferative response (Fig. 5b). Consequently, the diabetic phenotypes in 11-week-old Crif1 beta−/− mice can be explained by both accelerated beta cell loss and failure of compensatory beta cell proliferation. Restoration and maintenance of beta cell mass by preventing the progressive loss of, or enhancing the proliferative potential of, beta cells may be a viable therapeutic option for the treatment of diabetes [44, 45]. Exenatide (synthetic exendin-4) has the potential to prevent the progressive loss of beta cell function and beta cell mass associated with type 2 diabetes . GLP-1 promotes beta cell proliferation and inhibits beta cell apoptosis [34, 35, 47, 48]. Therefore, we treated Crif1 beta−/− mice with exenatide and observed glucose tolerance and beta cell proliferation. The proliferative effects of exenatide were observed in WT mice, but this effect was absent in Crif1 beta−/− mice. Based on these data, exenatide does not appear to be a candidate for the treatment of diabetes caused by mitochondrial dysfunction. As mentioned previously, beta cell-specific deficiency of Tfam, an essential factor for the transcription of mtDNA-encoded OxPhos polypeptides, causes diabetes from approximately 5 weeks of age, characterised by impaired release of insulin from islets in response to glucose stimulation. Older beta cell-specific Tfam-knockout mice exhibit increased oxidative stress and reduced beta cell mass, without increased apoptosis in islets. The reduced beta cell mass of Tfam- and Crif1-knockout mice may not be owing to increased apoptosis (ESM Fig. 5). Insufficient compensation for islet beta cell loss in Crif1 beta−/− mice may result in reduced islet mass. A common variant (rs950994) of the TFB1M gene was recently reported to be associated with reduced insulin secretion, elevated postprandial glucose levels, and an increased risk of developing type 2 diabetes . Accordingly, mice heterozygous for Tfb1m deficiency exhibit reduced levels of TFB1M in islets, impaired mitochondrial function and reduced insulin release in response to glucose in vivo and in vitro. Additionally, in mice in which Tfbim is specifically knocked out in beta cells, ATP is depleted and the level of reactive oxygen species (ROS) is increased, which led to loss of beta cell function and mass owing to increased apoptosis and necrosis . Animal models of mitochondrial dysfunction in beta cells, including Crif1 beta−/− mice, show sequential beta cell dysfunction and beta cell mass loss, reminiscent of the development and progression of type 2 diabetes in humans. Further studies are required to determine the clinical implication of CRIF1 deficiency in human disease and to analyse the function and mass of beta cells in Crif1 beta+/− mice. In summary, these findings indicate that knocking out Crif1 in beta cells, which results in impaired OxPhos function, may trigger progressive beta cell failure and negate the proliferative effects of exenatide. The homozygotic Crif1 beta−/− mouse model showed accelerated progressive beta cell failure, which will be useful for the study of beta cell failure caused by mitochondrial dysfunction. MS acknowledges financial support from the Basic Science Research Program through the National Research Foundation of Korea (NRF) funded by the Ministry of Education, Science and Technology (2012M3A9B2027958), MOE, Korea. This research was supported by the National Research Foundation of Korea (NRF) funded by the Ministry of Science, ICT & Future Planning (2012R1A2A1A03002833). The funders had no role in the study design, data collection and analysis, decision to publish or preparation of the manuscript. YKK, HJK, HaK, C-HL and MS made substantial contributions to the conception and design of the study. YKK, HJH, MJR, SJK, HyK, KSK and SHL were responsible for the acquisition of data and provided materials for animal experiments. HKC, MHL, SEL, MJC, KHJ and GRK helped with the analysis and interpretation of data. YKK, MJR, JYC, HaK, HJK and MS wrote the manuscript. All authors contributed to the discussion and revised the article and all approved the final version of the manuscript. MS is responsible for the integrity of the work as a whole.